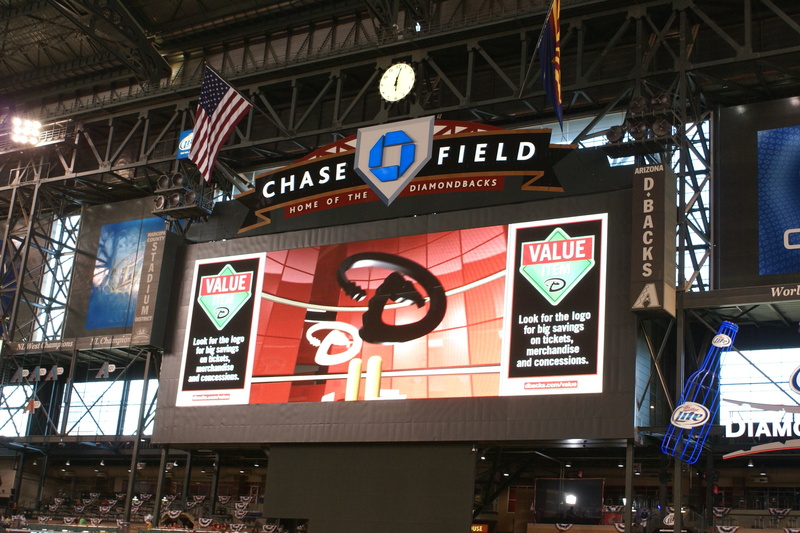 Travelling to Arizona gave me a great chance to take a look into the heart of the Diamondbacks and the home they call Chase Field. Arizona in general is a beautiful place and Phoenix is no different. I wondered how the stadium would look and how the fans would cheer on the team. Would the food be any good and could this place blow me away? 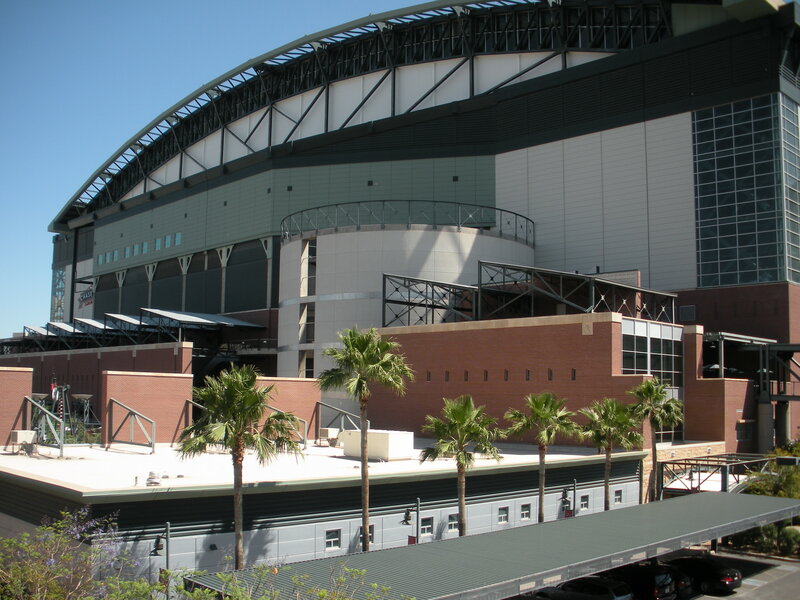 Driving down the highway to Chase Field, I had all types of ideas on how the stadium would look in the desert. I knew it was an indoor stadium due to the extreme heat of the land, but I wondered how it would stand out. The first thought I had was, “This is it?” I checked with Rita (Rita is what I named my GPS) and sure enough this was it. It looked like a warehouse slash museum and really didn’t strike me as a baseball field. I hoped the inside would be a step up from the disappointment seeing it while driving up. I knew coming from Coors, which was molded after classic style stadiums, that I may have an unfair bias. The downtown reminded me of Los Angeles with palm tree lined streets and the weather outside was hot but not overwhelming at this point in the year. Actually, that first day I had to put on the air conditioner driving in, because coming from Colorado and the spring mid 50’s I was accustomed to, the 85 degree plus heat took a little getting used to. Next to the stadium is a parking garage, which was a welcome sight, thinking how my car would roast in the sun. For opening day of the season, I thought the 12 bucks they were charging was fair. The garage was literally right next to the stadium and even had connecting bridges where you could get your ticket scanned in as you were heading in. There is plenty of parking lots charging less outside of the garage but you were subject to the heat of the day getting back in your car. Like I said before, Coors is molded after classic fields like Ebbets field with the rotunda and entry way. Walking to the front of Chase, I immediately noticed the difference. Outside of Chase there is an open square like area where people could mingle and booths were set up. It wasn’t the worst thing I’d ever seen but it didn’t really give me the feeling of baseball. If I didn’t know a baseball game would be held inside, I honestly would have said it was just another building. Inside the field is like really any other baseball stadium in a lot of ways. The first thing you will notice is everything is red. Signs, banners, seats, red, red, red. Somehow you would think they could switch up the color scheme a little bit, but you get red. The concourse surrounding the field is open and filled with food and beer vendors and there is not much difference here. Sitting in the outfield I did notice a water like smell. After thinking it would rain, I was told the smell was from the pool.”The pool ,” I asked? A freakin pool in the outfield? I had to see this. Yep, sure enough there is a pool in the outfield. Now I have seen this sort of thing in a Triple-A ballpark, but seeing in this in the majors struck me as tacky. Seating in the ballpark is not bad and the prices are very fair. 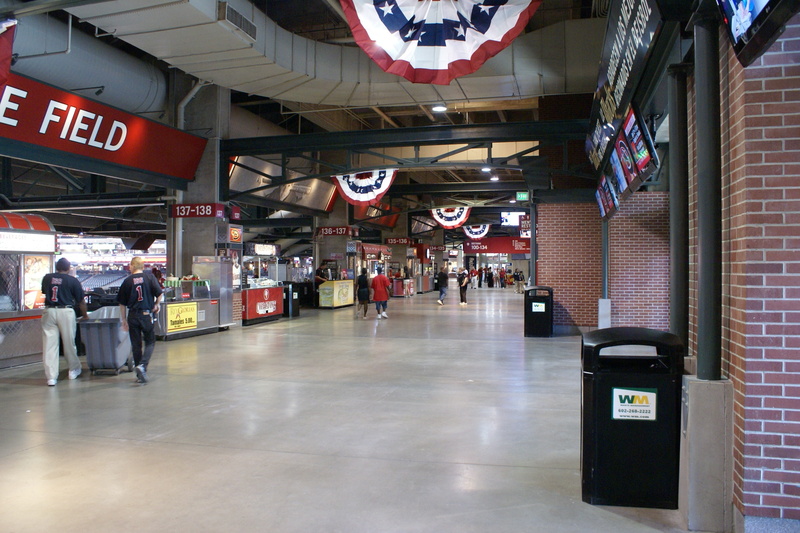 Just like any field, the prices rise as you get closer to home plate. You can catch a ball in the outfield for about $16 and if you were budgeting you can get seats in the upper deck for about $10. The prices would definitely keep me coming back if I were a Diamondbacks fan. By the far the best attribute of the stadium is obviously the temperature. 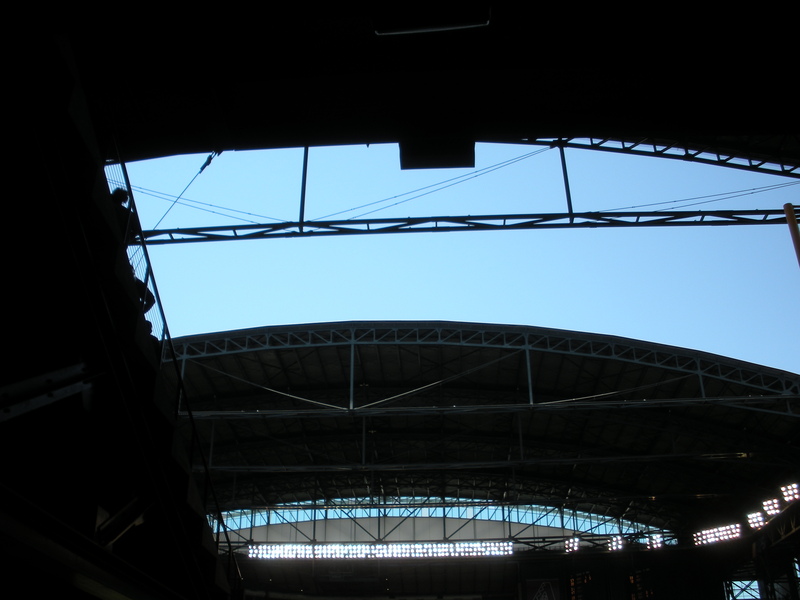 The roof can be opened if the conditions are right and there are no dust storms or crazy high temperatures outside. It is very nice when the roof is open and it was a great game Tuesday night, watching the game under the stars. When the roof is closed, the stadium is often kept about a tropical 72 degrees. I had no complaint with the temperature at all. The staff of the stadium was generally very nice too. One usher even joked with me and didn’t pretend to not recognize I was decked out in full Rockies gear like some others did. As I was walking down the steps she joked, “Should I trip you now or later?” After chatting with her for a bit she was very knowledgeable on the game and a joy to kill a few minutes with. Overall Chase Field is not the worst place to catch a ballgame from a stadium perspective. If I had to rank it with a ten being the best, I would say it is a six. I rank it lower because I look to a field not only as a place to play ball but a place to inspire. The stadium is functional to play ball but I don’t get excited going to it. This shrine could be forgettable. Perfect temperature at all times. Cheap seats and plenty to choose from. Plenty of vendors to choose from. No shortage of restrooms on any level. 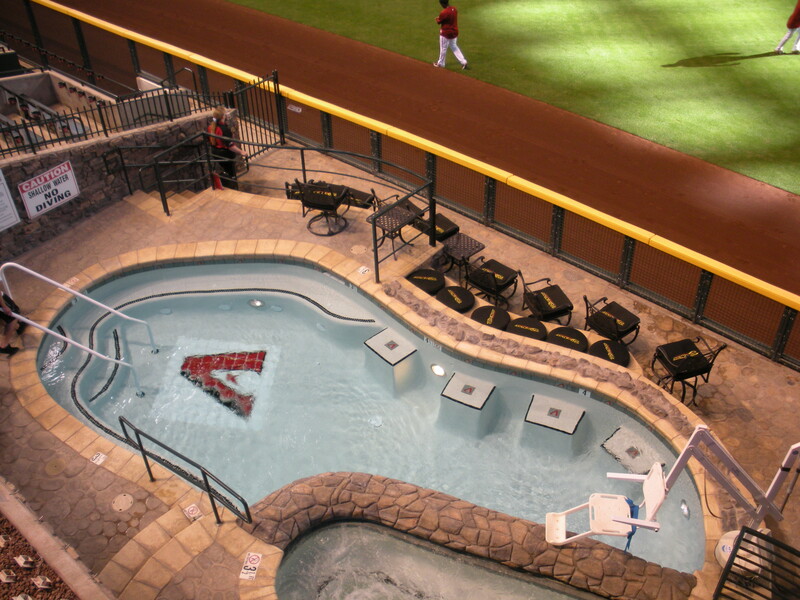 A swimming pool in the outfield. Really? Not the prettiest field or feeling of baseball. Always a night game feeling unless the roof can be opened. If you don’t like the color red, never step into this venue! The 2009 season holds some new venues for fans in New York. Multi-million dollar facilities like Citi-Field and the New Yankee Stadium boast newer luxury suites and nicer amenities. They come with more elevators and fancier rotundas that look to replicate older style stadiums. Yet, older style stadiums oddly enough are no longer enough. Whether it’s not enough room in the public concourse or seating that’s considered too tight, these new stadiums aim to please and bring in the fan base. I am saddened by the loss of older stadiums with a great deal of history and tradition behind them. 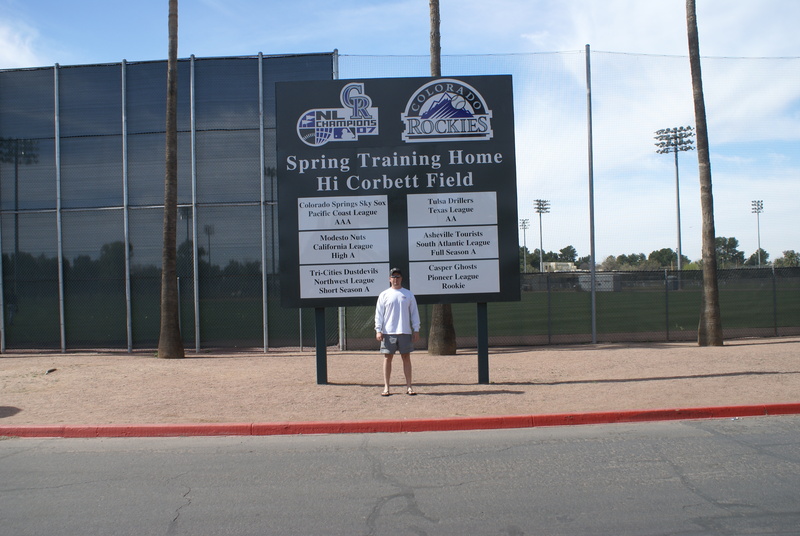 Day by day it seems likely the Rockies will be leaving the Tucson spring training facility they have called home since their inception in 1993. Hi-Corbett Field is a smaller field that holds 9,500 fans and first opened in 1937. It was remodeled once and renovated three times. Its charm is pretty evident as every seat is a good seat. There are no cup holders and many of the seats along the baseline are metal benches that can get pretty toasty in the Arizona spring. For me this is the charm. It is about the baseball being played not overdoing the items in the ballpark. Don’t like the lack of shade bring sunblock. If you’ve ever watched the classic comedy Major League you will recognize Hi-Corbett. It was also home to the Cleveland Indians from 1945-1992. The Rockies took over in ’93, but more and more teams have been shifting to the greater Phoenix area to set up their long term spring training needs. The great exodus from Tucson has been working its way towards the Rockies organization for the past couple seasons. The White Sox left Tucson this year and the Diamondbacks and Rockies are the two left standing. 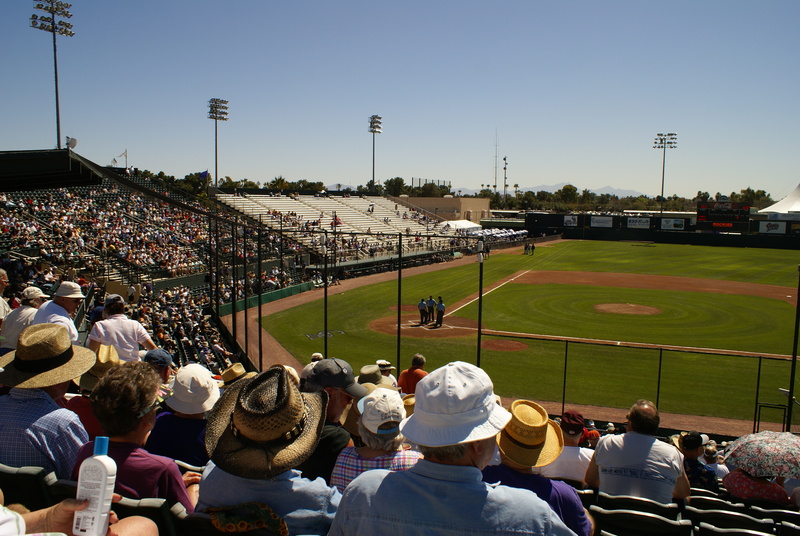 The Rockies were reported to have asked for their Tucson digs to get some improvements. The Pima County voters and Arizona legislators would have had to approve such a request. It doesn’t look like this economy will really be good for getting some new improvements out of taxpayers. The Rockies have a contract through with Tucson 2011 but have a neat little clause that lets them out of the contract if less than three teams are left in Tucson. Just a hunch but I see my destination next year being Phoenix, so I’ll be sure to take in the history of an old friend Hi-Corbett at least one more year.